If you are new to painting and especially to pouring, when someone first mentions doing a dirty pour you might do a double take. 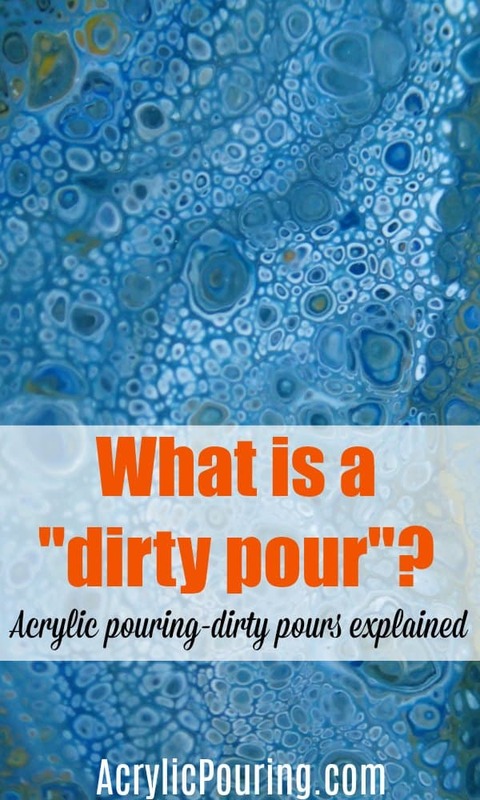 What is a dirty pour? What exactly do they mean by that term? Why is it dirty? Do they mean that the paints are dirty colors, or that there is something ‘dirty’ about it; like they’ll be pouring paint while dressed only in their underwear? It is some kind of painting fetish that you don’t know about? I admit the first time I heard the term I didn’t know what to think, but it didn’t sound an attractive way to paint at all! Who wants a dirty painting? In fact, many of the acrylic pours you’ll likely enjoy doing, if not most, are dirty pours. It’s simply a term for mixing more than one paint color in the same container before adding it to the canvas or substrate. You can add two, three, four or more pre-mixed colors into your cup or container, and then pour them onto your canvas in a single puddle, in a circle, a square, rows or just randomly across the canvas. The paints mix as they leave the cup blending the colors and creating interesting and sometimes unexpected colors and results. You will usually then tilt the canvas back and forth to move the paint, cover the canvas and the sides and create a composition that you find pleasing. Gravity creates the painting for you! On a larger canvas, several different dirty pour cups might be needed. You can even create ‘double dirty pours’ by using different colors in different cups, such as a blend of blues and greens in one cup, and then reds and yellows in another cup. When poured separately onto the canvas these two different dirty pours can be blended or kept more separate according to the look you are hoping to achieve. It can be a lot of fun. Nothing dirty about it – unless you choose colors that don’t work together well in which case you could end up with ‘muddy’ colors. Do you have an educational or informative website? I am looking for an informative website. I am very grateful for the many folks who have essentially reached out to the rest of us with instructional video’s and I have watched a BUNCH of them. I am very interested in Pour Painting. Of all the video’s I have watched NOT ONE OF THEM DESCRIBES “the paint” itself. In other words, you will hear the person narrating the video using phrases such as “then you take the paint and you…..” – my questions WHAT PAINT??? I understand it is acrylic paint we are talking about here but just what SPECIFICALLY are we talking about here? 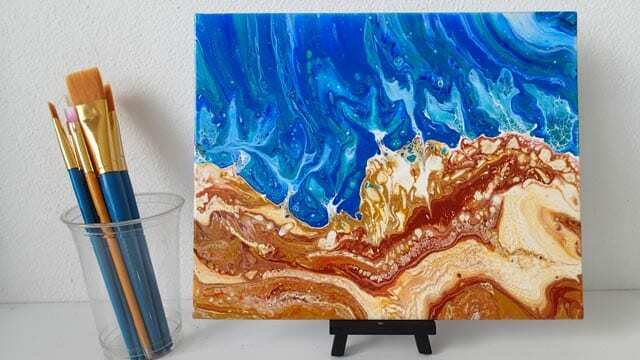 Do you go out and buy “acrylic pour paint”? is there even such a thing? If not, do you make it yourself somehow watering down paint from tubes (such as Liquitex Basics – for example)? If so, how much paint vs how much water? And what about ‘pouring medium’???? some videos mention them as though they are an integral part and others don’t mention them AT ALL. Would someone out there with true know how on this subject please tell the rest of us who wish to learn just what the mean SPECIFICALLY about “paint” – how to make or where to buy and what PRECISELY it is called and whether or not you really need ‘pouring medium’ or if WD40 or “silicone spray” or “Rainex” is better etc PLEASE???? Many of the videos either describe their recipe or it will be included in the description section under the videos. All recipes are different and painters usually develop their own with certain ratios of paint, mediums, water and oil according to personal preferences and the results of their own experiences. All of my videos describe the ingredients and recipe I’m using usually, so perhaps you are just watching the wrong channels. There is no one product that is better than another because everyones experiences with that product might be different so you have to try them for yourself and decide which one you like best. If you want a proven recipe that you can follow, I have one in my Getting Started ebook and two in the Acrylic Pouring for Beginners video class – or simply follow any in my recent videos. Thanks for all five lessons. Very informative. You may use cheap acrylic paints for a start and mix them with a mediuim to thin them. If ur on a budget, you may try mixing any craft glue like Elmer’s (3/4 glue mixed with 1/4 water) with a tablespoon of your acrylic. Depends on the consistency that u desire, you may add a bit of water as you mix. 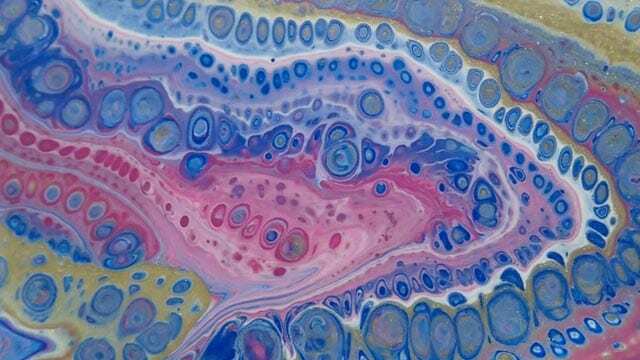 Add a drop or 2 of silicone to make cells. I just use Biosilk Hair Therapy Argan and it works just fine than buying expensive brands like Liquitex. However, if you can afford high end brands then use them. Am sure they are priced for best results. Goodluck on your pours. How do you determine the amount of total paint needed for a canvas or other surface? If I have a canvas that is say, 24X24 inches, how do I figure out how much paint to use, or do I just experiment. I don’t want to use too little, but I don’t want to use too much and have it crack. Thanks for this information. So far, so good, but I want to go bigger and bigger!